Picture this – you’re heading to the beach with the kids in tow, buckets and spades galore and you want to call in to the supermarket on the way home. The last thing the kids want is extra clothes layered over their swimmers nor do you want to be chasing articles of clothing across the beach. You need a kaftan! A simple, glorious kaftan is all the kids need to throw over their swimwear to instantly become ‘dressed’. Being a one-piece cover-up as well as light and breezy, it’s perfect for easily getting on and off. The new summer 2010 collection of kaftans at Kaftan Kids is delightful. All kaftans are made from 100 per cent cotton fabric with fine touches of embroidery, ribbon and beadwork to make each kaftan as unique and special as the wearer. The Peaches and Cream and Paris Pink are perfectly pretty with their bold flower prints on subtle shaded backgrounds of cream and pink. I personally love the Moroccan Mint in stunning green and touches of blue and pink. 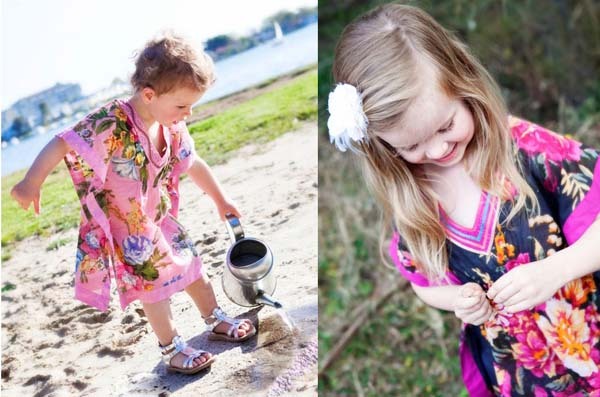 Kaftans are available to fit kids aged one to five and come in a myriad of colours and designs for $27.95 from Kaftan Kids. Australian delivery is available for a very affordable flat rate of $4.20.